We have a big weekend planned and hope that you will enjoy yourselves as you reunite with your classmates and take part in the festivities. If you haven't yet visited the new John Monroe J. Holliday Alumni Center, we encourage you to do so. The new alumni center, just across the street from Hagood Stadium, is the hub of all that is going on this weekend. Please make yourself at home and visit the alumni center's gift shop while you're here. Following is a schedule of all that is going on. Please note the change in the Gospel Choir's performance. It is now at 7:00 p.m. in Summerall Chapel. We're happy to have you back home again. Nancy Mace will be in Charleston during homecoming weekend to sign copies of her new book, "In the Company of Men: A Woman at The Citadel." Brigadier Foundations Coach Ellis Johnson Breakfast Meeting, Johnson Hagood Stadium. Free. Captains Choice Alumni Golf Match, Patriots Point Golf Course, Mount Pleasant. $75 per person. 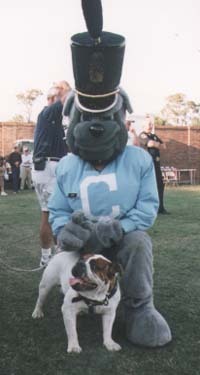 Lunch ($5; make reservations by Nov. 7) Citadel Alumni Association, Holliday Alumni Center. 1:30 Alumni Tennis Tournament vs. VMI, Bunch Courts. Lunch and football tickets and mementos on sale, Holliday Alumni Center. 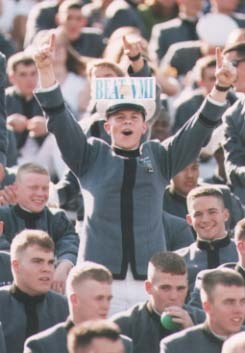 after parade to 6:30 p.m. Citadel Young Alumni (Classes 1982-2001) informal gathering with complimentary snacks and drinks, Alumni Center. Concert by The Citadel Chorale, Summerall Chapel. Cadet Ice Hockey vs. VMI, North Charleston Ice Palace, Northwoods Blvd. Homecoming Hop featuring The Tams, USS Yorktown. Semi-formal. Annual breakfast for past presidents, Citadel Alumni Association, Holliday Alumni Center. Alumni Information Center hosts visitors coffee, sale of lunch tickets and mementos, Alumni Center. Himelright Scholarship presentation, LeTellier Hall. Sale of football tickets, Johnson Hagood Stadium. The Citadel Athletic Hall of Fame induction ceremony, McAlister Field House. 9:30 a.m. Boxing team sparring session against VMI, Deas Hall basketball court. Summerall Guards perform, Summerall Field. Homecoming parade review and recognition of The Arland D. Williams Society Inductees. All alumni to take review, Summerall Field. Lunch in Coward Hall $5.50. 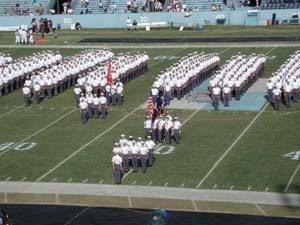 Football: The Citadel vs. VMI. Halftime includes recognition of the Athletic Hall of Fame inductees and a performance by the Regimental Band and Pipes. Alumni Gospel Choir performance, Summerall Chapel. Free. Post-chapel reception, Mark Clark Hall reception room. 11:00 a.m. Veteran's Day Service featuring the Cadet Chorale and the Reverend Ladson Mills, '73, Cathedral of St. Luke and St. Paul, 126 Coming Street.